Our first winter storm of the season is named after Ariana Grande! This year the WFSB weather team is naming the storms after chart toppers, and our Facebook followers cast their votes and Ariana won big! Ariana Grande is big in our house…my daughter absolutely loves her. Naming winter storms is a longtime tradition here at WFSB (and WTIC before), that began decades ago with the Travelers Weather Service at the old Broadcast House in downtown Hartford. Over the years past meteorologists Charlie Bagley, Hilton Kaderli, Barbara Allen, Joe Furey and others reported through storms Larry, Ginger and the list goes on. Our present day team of Bruce DePrest, Scot Haney, Mark Dixon, Mike Cameron and Melissa Cole will get you through the storms of this winter. A couple of years ago, the team named a storm after famous Connecticut residents, including this guy. 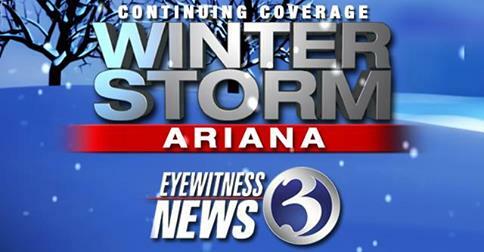 Tune to Channel 3 Eyewitness News for the latest on Winter Storm Ariana and its impact on Thanksgiving. Learn more about Ariana Grande right here: http://www.arianagrande.com/ By the way, she is coming to Connecticut in March, to perform at Mohegan Sun.